I have heard the phrase "metal is not music" so many times in my life that the phrase has lost all meaning. It seems to me that I'm leading a fairly normal life with kids, a house (in the city), work, and hobbies, but I still listen to death metal. Death metal reminds me of good times and great people that were taken from us too soon. It also seems that most people who make the non-music claim also would be shocked to find out just how hard a lot of this music really is to play, even if the vocals might not be the hardest to learn, but hey, most of the vocalists play guitar too. 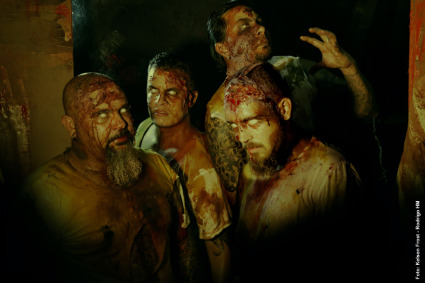 Brazil is one of those countries that just keeps cranking out more and more extreme metal. Pathologic Noise is an underground band, but let's turn over the stone and shine some light down there. Our new Brazilian friends chose to eschew with a long introduction on this one and chose to get to heart of the matter. Right out of the gate it leaps, fights, claws, grinds, and growls. There are two guitars and they are not silent. Both are scratching at the walls of the coffin. Vocally, Glenn Benton couldn't ever sound this evil. It's not just the growls, but the ferocity. They are thick and full. I feel there may be some computer enhancement, but I refuse to find out for sure. The ubiquitous blast beats are there creating the beating of the dying heart. There are few shredding, facemelter solos, but plenty of tasteful, melodic lines. The juxtaposition of beauty and savagery were not lost on this writer. Pathologic Noise, though writing about some interesting t hems, straddles the line between 90's and modern death metal. By taking bits of the old and bits of the new, there's a marriage of all things death. Album Review: "Odio 666" by Certo Porcos!